Having flown ANA’s 787 with their regional recliner seat, as well as their 777 with the staggered business class seat, I was anxious to try the newer staggered seat on the 787-9 series. 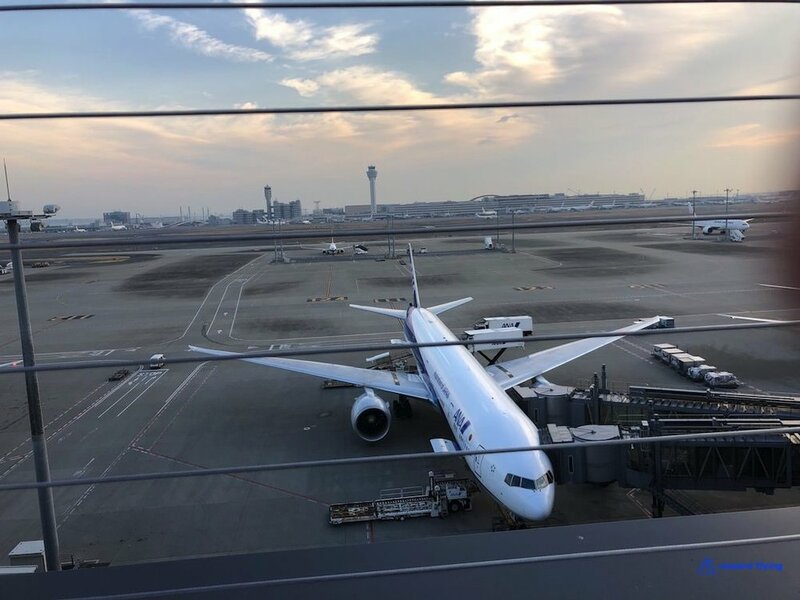 It was a brisk Tokyo morning hovering around freezing, not perfect for planespotting at Haneda’s observation deck, but a least a short visit was required. After a disagreement with the young lady at security over Gold Track admittance which I am and was denied, I made it to the gate in time even after a long 25 minutes through security. I didn’t put out too much of an argument as I’d rather take the flight than irritate some foreign TSA agents and be detained. Boarding was precise and I found my way to seat 4K for today’s 4 hour flight down to Hong Kong. Taxing out we passed another 787 operated by Air Japan. In fact the aircraft I was on is operated by Air Japan. ANA currently owns 66 787 aircraft with 1 being stored (Rolls Royce engine related?) and 28 are operated by Air Japan, according to data published by Planespotter.com. Another chance to be entertained with ANA’s “Edo period“ safety video. The airshow had an out of plane experience showing the long taxi to Haneda runway 5 which is used for west and south bound departures. While the -9 variant of the 787 isn’t as quiet as the -8, it is still one of the most quiet aircraft on take-off of any plane I’ve been on. 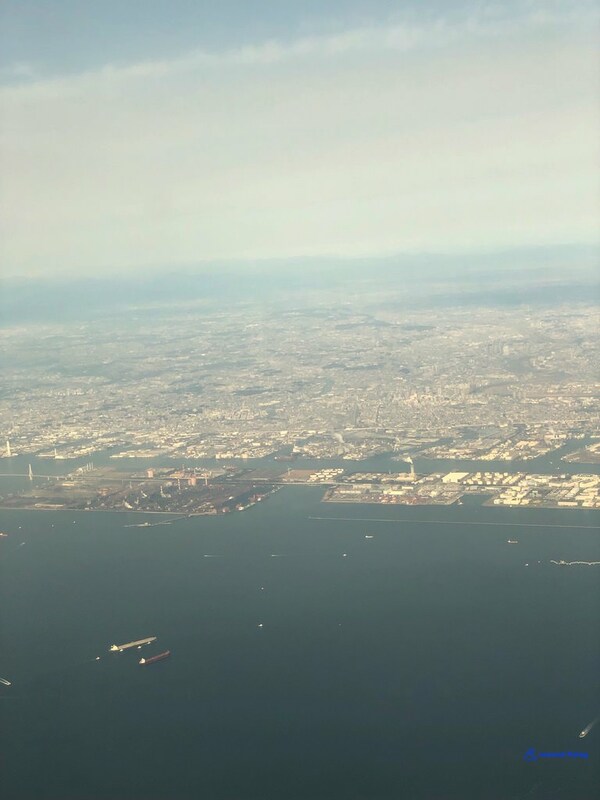 Turning back to the south gave a stunning view of Tokyo on this beautiful morning. The front cabin of this ANA 787 was full for this flight. In fact when I booked it there were only 2 seats left, unusual to get an award ticket when so few revenue tickets are available. ANA takes full advantage of the various mood lighting schemes during boarding and in-flight. Aircraft interior pictures are at the mercy of too little light or in this case too much light. Center seats have plenty of privacy, however at the cost of being able to converse with a flying partner, as it appears these partitions are immovable. Lavatories were stocked with amenities as well as the Japanese washlets system. A poor sneak peak at the mini cabin aft of door 2. Originally I had seat 10K, looks like a quiet option, except for boarding. Back up at 4K. The beige table top is new to these 787 staggered seats. The whole color combination is rather odd in my opinion but they didn’t ask me and it doesn’t affect the comfort which is great for a business class seat. Perfect positioning for window gazing. Most of these seat handles were showing wear and tear. 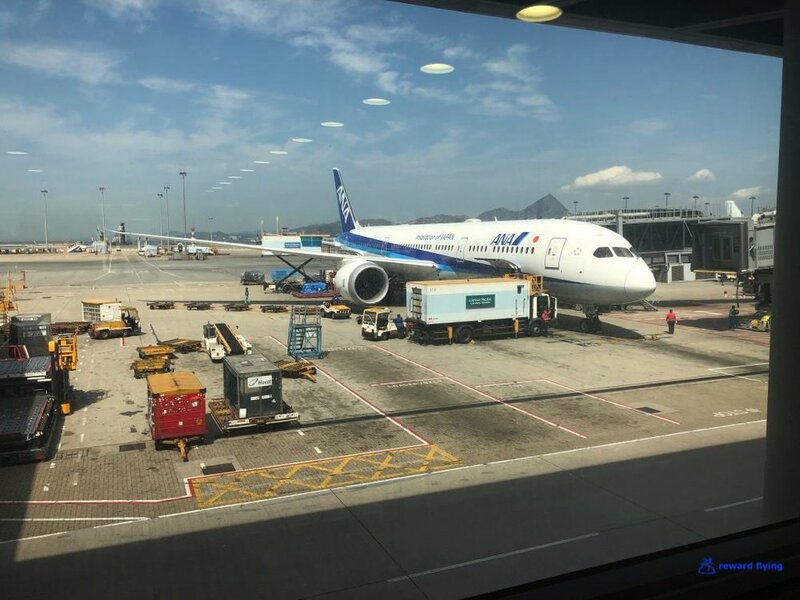 This aircraft was delivered to ANA in September 2017, so only a little over a year in service. Underneath the monitor is an ottoman and storage area for a carry on. The footwell looks plenty wide enough if using the bed. If you do lower the seat into a bed the armrest collapses and extends to give a wider sleeping surface. 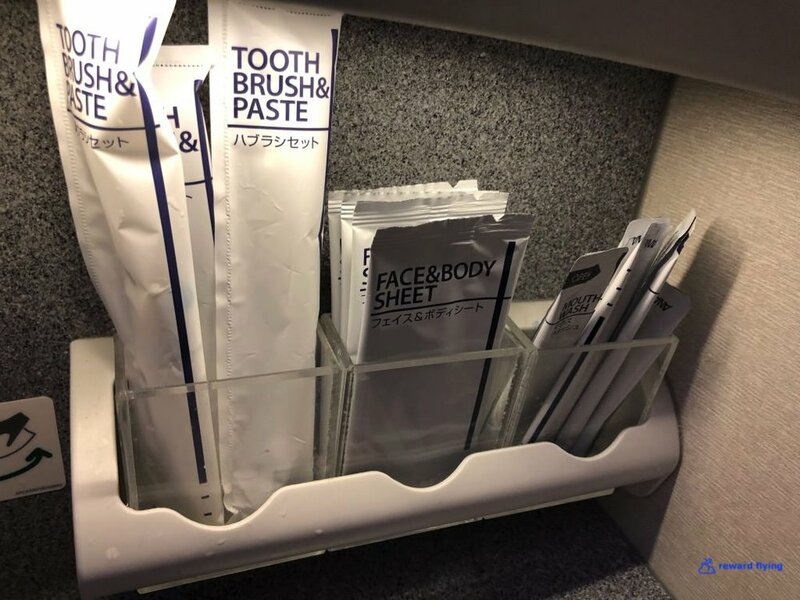 It also shows how filthy airplanes are. This coat hook could block the monitor depending on the size of the coat. Simple seat controls that are out of the way and difficult to accidentally move. Overall a well designed pod puts everything within reach and out of the way. And a printed guide to the seat. While First Class headphone are Sony, Business Class headphones are Panasonic. Makes sense. Beverage menus for this flight. Being a morning flight my interest focused on coffee and Kabosu which was very refreshing. I couldn’t pass through Japan without having some Japanese Cuisine so the choice was simple. Sushi with Tamagoyaki, well it was breakfast for me. This was fabulous. Marinated Japanese parsley, paprika rolled beef and tofu refuse. About the only thing not consumed. Alfonsino. New to me, it’s a deep temperate water red bream. Delicious. This was a very unexpected delicious meal. Who said you can’t get good food on an airplane! Speaking of food, during the flight I watched a documentary on a French Chef named Alexander Gauthier. He’s famous for his restaurant in La Grenouillère France. A few photos of his “food”. The air show indicated it was time to get ready to land. 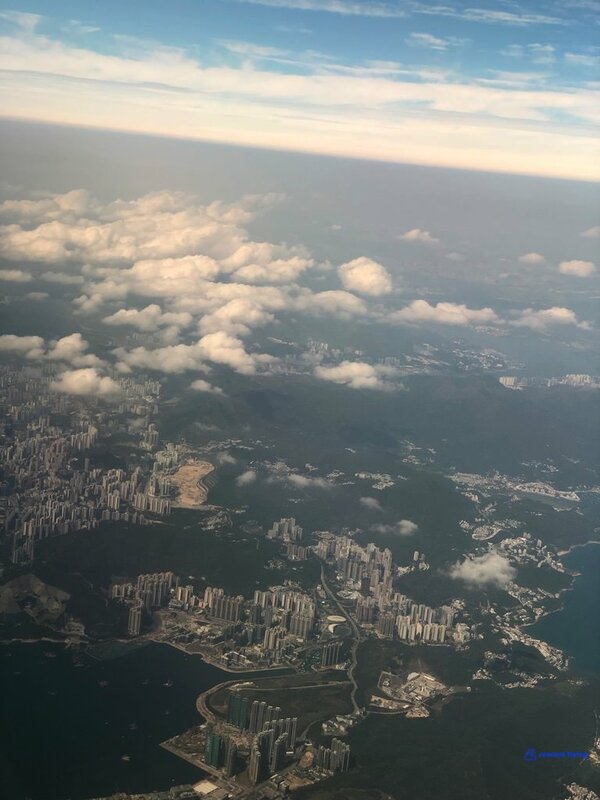 Which made for some pretty spectacular views of Hong Kong, or maybe it was just that it wasn’t cloudy and you could actually see Hong Kong. 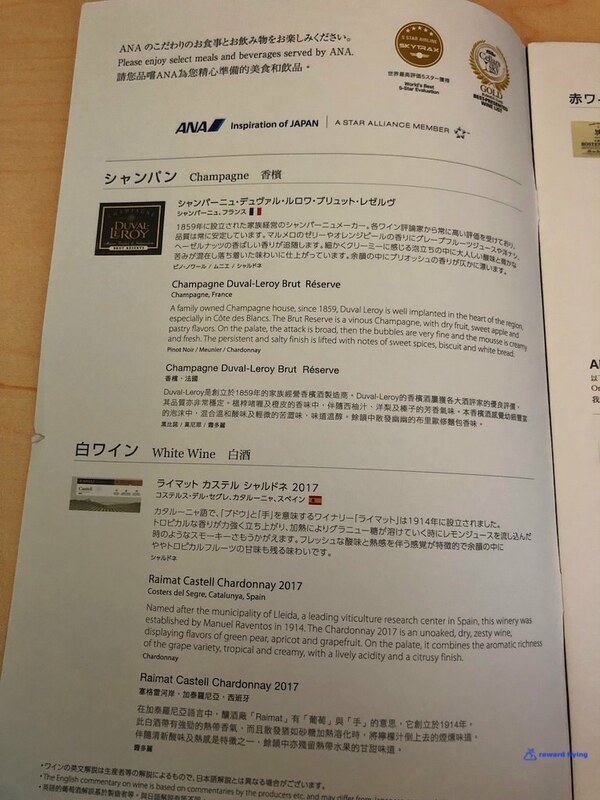 This ticket was not connected to the ANA First Class redemption. I procured this HND-HKG trip with 22,500 LifeMiles. Compare that to United 45,000, Aeroplan 40,000. However Singapore Krisflyer is 22,500 as well. LifeMiles often has bonus programs for transfers with AMEX and Citi Thank you points. ✔︎This is a nice cabin. It’s not overly attractive but the 787 is airy and has those windows! I happen to like the staggered seats that ANA uses. These Zodiac Skylounge forward facing seats have nice footwells for sleeping comfort and are well thought out. However the cabin is showing some wear on a plane that has only been in service for 15 months or so. ✔︎The food was excellent on this 4 hour flight. ✔︎ The monitors are fairly small but the content was excellent. ✔︎The crew was was fine. Nothing to complain about, nothing to rave about. ✔︎Boeing 787-9 New technology, 15 month old aircraft, those windows! Overall this was one of the best under 5 hour wide-body flights I’ve taken and I’d happily fly ANA in Business Class again. Having flown ANA’s 787 with their regional recliner seat, as well as their 777 with the staggered business class seat, I was anxious to try the newer staggered seat for the 787-9 series. As any confessed avgeek would do the morning of a highly anticipated flight, they would check for the assigned aircraft to their flight. Todays’ aircraft would be JA789A, Star Wars BB-8! 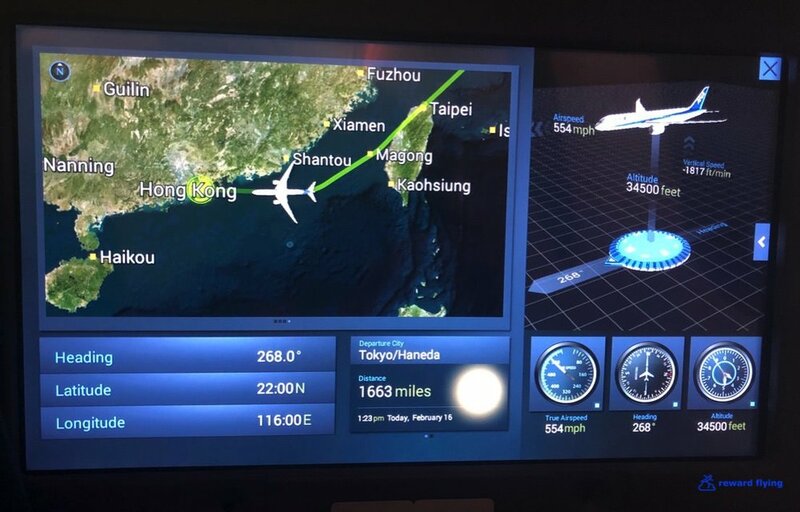 The first leg of a 32,000 mile 11 flight journey around the world on ANA in the "Square"
While Icheon Airport in Seoul gets all the accolades, their regional airport Gimpo, is amazing as well. Easy to get to with using the subway you walk underground from the subway station to the airport. The terminal itself is fairly small. Typical for a major city’s second regional airport. It’s brand new and empty. This was a great flight on a world class airline. It hits all marks for what you want with international travel. From a beautiful comfortable cabin, to delicious food, great entertainment and courteous friendly flight attendants, ANA scores high on all.